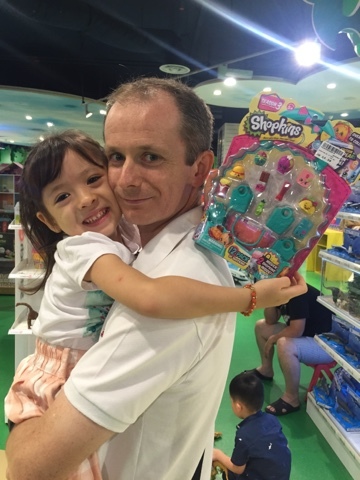 Prior to our Manila trip a month ago, I had no idea what Shopkins was. My daughter seems to have caught onto the Shopkins fever through the occasional YouTube. I sometimes allowed her to use my iPad *yikes* and she discovered Shopkins there. I only became aware of it when we were in Manila ... obviously my sister and mom spoiled the little kiddos, who came with me, and went on a toy shopping spree. 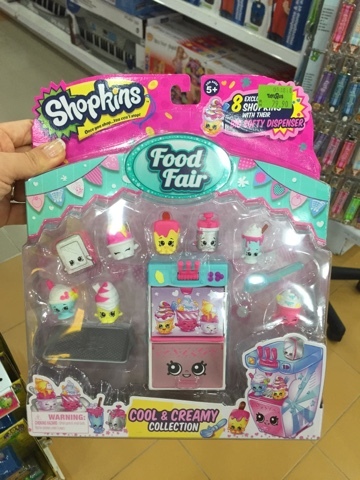 My daughter chose Shopkins, which at that time, seemed ummm... different (to me). For someone who didn't know what it was, I was kind of expecting more from it. I didn't understand why the little figures mattered. Nothing moved. It wasn't Disney stuff. There was no cartoons (at least to my knowledge) on our Netflix back in Malaysia. Hmmm... this is a mystery! Fast forward after a few weeks ... specifically in the month of August. I had to breathe a sigh of relief. Thankfully my sister and mom bought her Shopkins because it seems Toys R Us in Malaysia ran out of it. The ones we visited (Bangsar, Plaza Damas) didn't have any Shopkins at all. Fast forward August also -- I was much aware of how to play it and why it's so popular. 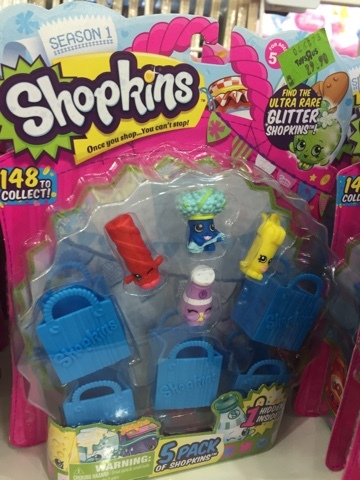 They are encouraging kids to collect all the hundreds (YES HUNDREDS or THOUSANDS) of Shopkins! And everything is promoted through online only. They didn't even have a proper full-length cartoon! Just snippets of 1-2 minutes video. However, they had a lot of "seeding" wherein kids are playing and doing a monologue as they open their Shopkins and collecting them. Genius. These people really knew how to reach out to the kids in this modern day! After careful googling, this desperate mother finally saw one blog that mentioned that Hamley's at One Utama may have it -- because she was able to buy it there. Of course, being the mother that I was, I made it into my objective for that weekend to head towards One Utama. We dropped by Toys R Us before walking to Hamley's and saw there was a rack with limited Shopkins packs... so I took note of what was available and went to Hamley's. There at Hamley's, the experience is soooooo much better .... space for kids to run around, the staff were knowledgeable and friendly. And their display execution was much, much more classier. 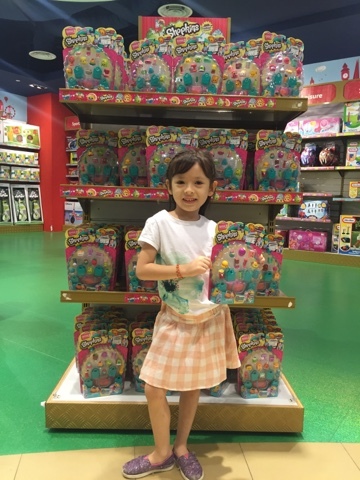 Imagine my daughter (and mine, too) excitement when we saw a whole rack of Shopkins! Daddy bought her one pack and she was so happy. I went back to Toys R Us to buy some small packs (to keep as reward gifts from time to time). Imagine the shock : some of those that I took pics of were not there anymore. Half of the rack was finished. All in just 2-3 hours time. 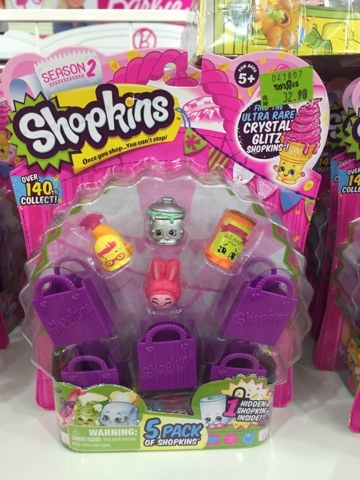 Shopkins marketing is GOOD! Giving daddy a great big hug ! Came back for these at Toys R Us and they ran out. All i have is a photo of it!